Review: Want to do something nice for your stockbroker this holiday weekend? Ask them to accompany you to a screening of The Big Short, pay their way in, and then when it’s over ask them to explain the film to you. Yes, this true story of the bursting of the housing market bubble is a dense watch and would benefit from studying a textbook beforehand…but at the same times it’s a riotously funny and routinely ribald comedy more entertaining than it has any right to be. Though I’m not normally a fan of director Adam McKay (Anchorman 2: The Legend Continues), he’s turned in his most timely and mature work to date, juggling multiple storylines and characters over several years without ever losing the thread of what a tremendous disaster this downfall was to the economy. Adapted by McKay and co-writer Charles Randolph from the book by Michael Lewis, The Big Short is big on market-savvy terms, facts, and figures but short on overall time to explain everything along the way. Following four distinct sets of characters of various stature that overlap throughout the years, it’s a movie you have to buckle up and into from the beginning. I was worried early on that I was going to wind up emerging as a true dumb dumb, never truly grasping the enormity of the situation or how things got as bad as it did. Thankfully, McKay’s script had the foresight to predict this and employs a clever means to explain things in terms that the average Joe (me!) can understand. I won’t spoil some of this surprisingly adept tactics for you, but I will say that it involves celebrities playing themselves breaking the fourth wall to speak directly to us. McKay was lucky to gather the high-caliber cast he did. It’s mostly a boys club here with the likes of Steve Carell (Foxcatcher), Ryan Gosling (The Place Beyond the Pines), Christian Bale (Out of the Furnace), and Brad Pitt (World War Z) taking on roles of those involved to varying degrees of seeing a problem on the horizon and then deliberately setting up the market to fail so they can profit. Moral quandaries are few with only Carell standing up for the littler guy, gaining a conscience that stands him apart from his cut-throat colleagues. In the supporting department, Marisa Tomei (Love the Coopers) is appreciated as always as Carell’s wife and even the usually campy Melissa Leo (Olympus Has Fallen) channels her natural tendency to overplay things into a dandy of a cameo as a Wall Street player conducting a meeting from behind some Mr. Magoo-ish optometrist shades. Strong turns from Rafe Spall (Prometheus), Hamish Linklater (Magic in the Moonlight), and Finn Wittrock (Unbroken) round out a uniformly strong ensemble. Though it deals with events that led to the ruin of many (mostly middle to lower class households), the film is surprisingly engaging and entertaining. It feels like the movie that The Wolf of Wall Street thought it was behind all of the showboating performances and excessive running time. 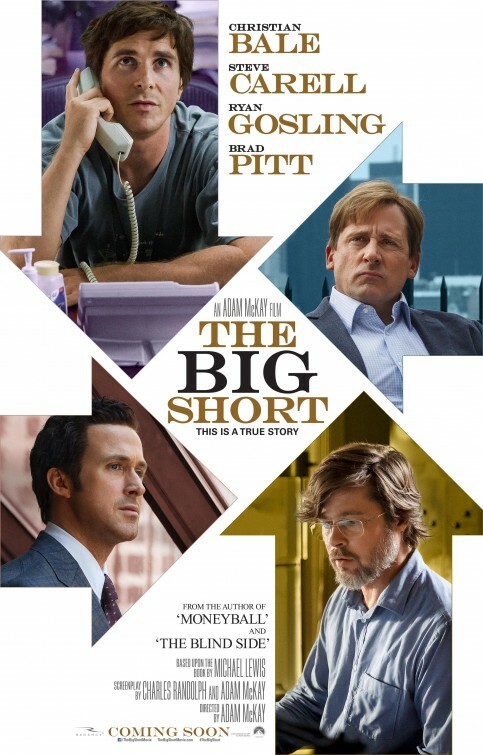 The Big Short is still too long at 130 minutes but unlike Wolf, it gives the audience someone (anyone) to relate to. The market is slowly building itself up again but if the final moments of the film are any indication, this is a problem that isn’t totally vanquished…making the movie ultimately a cautionary tale of unfettered greed and unregulated ambition.